The medium version of the Lightweight Audio Bag from Sachtler features a variety of innovative features designed specifically for sound recording engineers in the studio, on set, and in the field. The bag includes a transparent top window that allows for easy viewing of equipment controls within the fully padded main compartment. Access to equipment controls are provided by side, back, and top panels. Removable internal dividers allow for custom configurations of your gear and multiple storage pouches are provided for batteries, cassettes, and connectors to enable quick organization. The bag includes an extra divider to accommodate the Sound Devices 788T mixer with the CL8 controller attached. A double floor makes it easier to organize headphone cables. An internal pocket can house the mixer's battery and exterior straps allow you to carry a boom pole and extra cables with ease. The system can be expanded by using snap-on pouches for transmitters or receivers. An exterior front accessories pocket features a detachable frame that holds up to six wireless receivers and transmitters. For comfort while working, the bag features padded adjustable shoulder straps. Box Dimensions (LxWxH) 14.7 x 9.9 x 8.4"
Lightweight Audio Bag (Medium) is rated 3.0 out of 5 by 1. Rated 3 out of 5 by Bruce from Lacks configurability with fixed inside panel Overall this is a very well made bag with good design features. A problem though is the interior of the main compartment where there is a panel to divide the space and the location is fixed and cannot be changed. As a result I could barely squeeze in a Sound Devices 633 and with it so tight the interior stitching (which is exposed at the outer edge) would be worn in no time at all. 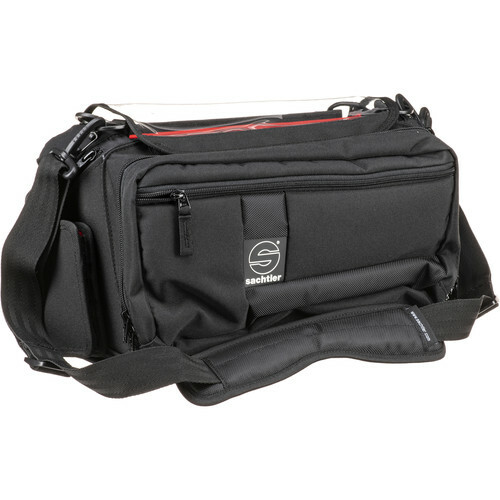 Although this is listed as a Medium bag it is actually a lot smaller in size at 330 cubic inches than the Sachtler Small SN601 bag which has 519 cubic inches of interior space.